This article is for developers about installing the core layer, sensenet Services, but before getting into that, please take a look at the concept of our install method. TLDR: jump to the Install packages section to get started right away! In the last couple of years NuGet became the industry standard for delivering (mostly open source) libraries and projects. In our case, we take this even further by letting you install a full ECMS right from Visual Studio. This is not a common scenario, so we have to approach it carefully (the upgrade process is still under development). sensenet is a huge product consisting of many smaller components (take a look at this curated collection of built-in and 3rd party components and plugins) that are not needed by everybody. It is best if you install only the parts you need, so that you can keep maintenance and upgrade costs at minimum. This is why we publish many small packages containing only the minimal set of libraries and content. About choosing the components you need, take look at this article that describes the main components briefly. If you have a single project in Visual Studio (a web application), this is not a problem. But if you have multiple projects (e.g. a business or data layer beside your web app) that also need the sensenet libraries (to access our c# api), you would end up installing content items that are needed only for installation and/or webapp-specific multiple times, in projects that do not need these items. SenseNet.Whatever: contains only libraries. Should be added to library projects that need only the references. SenseNet.Whatever.Install: has a NuGet dependency on the library package above, and contains installation artifacts: an SnAdmin package, config file or c# code changes/additions, anything that should go only to your web folder, nowhere else. Long story short: install the SenseNet.Whatever.Install package into your web application and the basic library package to your other projects. Watch our video tutorial where one of our developers guide you through the whole process. Create a new ASP.NET web application (using the MVC template, optionally adding Web api or Web Forms), or use an existing one. The install process described below is the same that you will see in the readme.txt that appears in Visual Studio after adding the install package. // all generated and custom method calls should remain here: GlobalConfiguration, RegisterRoutes, etc. Please do not override the whole method (! ), just the header, and add the base method call as seen above. Optional: update your Razor views (you can do this later at any time). Build your solution, make sure that there are no build errors. Before installing the sensenet Content Repository database, please make sure that you have access to a SQL database server. The process will modify the connection string in Web.config and Tools\SnAdminRuntime.exe.config files automatically, ensuring that it is pointing to your SQL Server (DataSource) and Database Name (Initial Catalog). 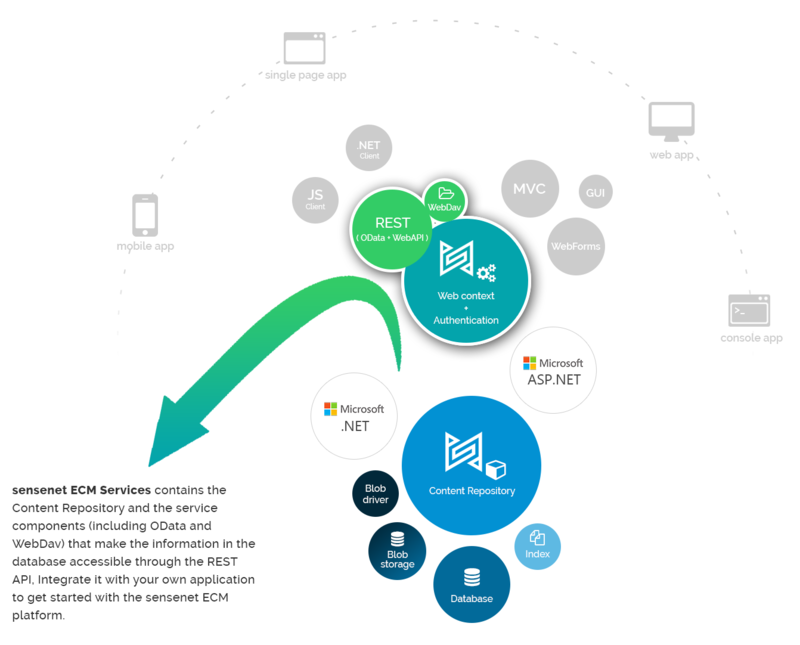 The connection string is configured to use Integrated Security by default (this means sensenet will use the Windows account you are logged in with to execute the install tool and later to run the web application). If you are using SQL Server authentication instead of Integrated Security, please provide the username/dbusername and password/dbpassword when you execute the install command described below. Open a command line and go to the [web]\Admin\bin folder. Execute the install-services command with the SnAdmin tool (you can specify optional parameters for SQL server, database name and user credentials). username (optional): in case of SQL authentication the username to access SQL Server with during the install process. dbusername: (optional): in case of SQL authentication the username to put into the connection string in config files. This is for the web application to access the db. Please note that if you want to use SQL auth during both installation and runtime, you have to define both the username, password and the dbusername, dbpassword pairs of properties, there is no fallback. The database also can be installed on Azure SQL. In this case you have to use SQL authentication due to the fact that the installer does not support Azure Active Directory authentication yet (but after installation you can change the configuration to connect to Azure SQL using AAD of course). Please note that if the database already exists, this tool will fail to execute. There is a ForcedReinstall:true switch that you can add if you want to execute this command repeatedly, for example in a build script. You are good to go! Hit F5 in Visual Studio and start experimenting with the sensenet REST api! In case of errors during execution, please take a look at the Troubleshooting section below, or head over to StackOverflow for answers. After you installed sensenet Services, you can start sending requests to the site. The response will contain a standard ASP.NET authentication cookie that your browser will send with subsequent requests automatically. For detailed examples, please visit the REST API article. Here are a few tips in case you encounter an error during or after installation. Please make sure that you have built the solution (and there were no build errors) before executing the install command.